The 49.9 metre superyacht Belongers has been delivered by French yacht builder Couach as the second hull in its 5000 Fly series. The kevlar-carbon constructed superyacht Belongers was launched March 2013. Hull No 2 in Couach's 5000 Fly series, Belongers shares her sister's, hull No 1 La Pellegrina, exterior styling, though updated with cool-grey hull colour. Belongers owner's brief called for an extended upper deck for more outdoor entertainment options. The sun deck now hosts 14 guests for al fresco dining, while the sun deck lounge hosts an office for the owner. Belongers also differs from her sister with the inclusion of a skylounge in the place of La Pellegrina's VIP bridge deck stateroom. The owner's wife collaborated with Couach on the interior design, which features interiors by Metrica. Belongers further stands apart from her sister with a technological advancement to her interior design. With her owner calling for increased on board comfort, Couach made noise and vibration level reduction a priority on its new launch. Couach's R&D department along with Van Capellen acoustic specialists carried out extensive research and developed the SilentCab suspension system, which is designed to separate the staterooms from the source of vibrations from the generators and engines. This is coupled with the VRS (Vibration Reduction System) with provides a systematic response to vibrations generated by on board systems. Running at 12 knots, only 42 decibels were clocked in the master stateroom, and this drops down to 35 decibels when anchored. 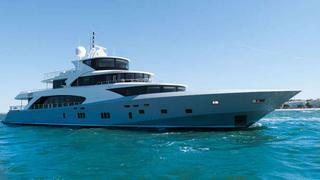 When she is running at top speed, Belongers can reach 28.3 knots powered by twin 5,230hp MTU 20V 4000 M93 engines.